We’re getting ready for Halloween around here. It’s never been a big part of this Steingruebl household, but this year Elise is ready. We’ve been talking about trick-or-treating and costumes. As you can see from our window, we have also been making decorations. 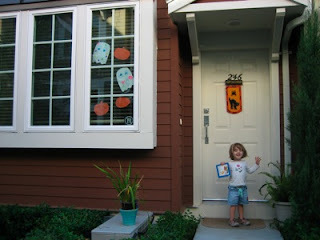 All of this means our house is spooky-or “pooky” if you’re 2 5/6 years old. Elise and Mommy went to the fabric store yesterday to purchase a pattern and fabric for a really cool costume. We’re not telling anyone what it is yet, but if you can get Elise to stop talking about trick-or-treating after you say the word “costume” you could probably get it out of her. Anyway, we’ll be finding another fabric store since one of the clerks followed us around the store remonstrating Elise for various imaginary breaches of etiquette. Mommy was not amused. More amusing, though, is Andy’s daily commute. A nice portion of his ride takes him through Guadalupe River Park and he gets to see all kinds of interesting wildlife! So far, it’s the birds who get him off his bike and muttering about bringing a camera along tomorrow. Today’s beauties included a great blue heron and a great egret. One of these days we’ll actually send him to work with a camera and we’ll put some pictures of the birds up! Here’s hoping that things are ‘pooky at your house too!